29 posts categorized "various musings"
Was not my grandfather made of the same stuff as yours? Didn’t they both love God and fight wars? Didn’t they both bleed red and sweat clear? Didn’t they both love deep, shed tears? Being a black American and coming from the Cleveland sports market is not a good formula for optimism. If you don't know anything about Cleveland sports (which is not the point of this post), suffice it to say that no major Cleveland sports franchise has won a championship since 1964 -- the year before I was born. There have been many lean years of horrible teams in baseball (the Indians), football (the Browns) and basketball (the Cavaliers), but there have also been years -- especially recently -- that have been filled with promise that would not be met. These recent years have been the worst ones to handle. When your teams stinks and you know it from the start, you kind of get used to the idea of losing. It even becomes a badge of honor of sorts. You talk about how much you have suffered, you share stories of frustration with other long-suffering Clevelanders. You talk about the Drive, the Fumble, the Shot and any number of times that our teams "coulda" or "shoulda" won but didn't. And now, I am in the midst of a trifecta, of sorts. In successive seasons, the Cavaliers (to a lesser degree), Indians and now Browns have performed below the lofty expectations that analysts had predicted for them. This was to be the Indians year to win the World Series. Not even close. The Browns were supposed to break through this year to be a force in the NFL. Last night, they lost their third game to the start the season and seem to be headed for disaster. Normally, at my age, I find that sports no longer affect my morale. But as I dejectedly turned off the game last night I realized I was feeling something that went beyond football. That's what brings me to the real subject of this post. I realized while lying in bed (the game ended after midnight for me here in Paris) that what I feel about many things right now parallels what I was feeling about my floundering football team. Indeed, as I have struggled to bring myself to write about the U.S. Presidential election, I realized that in many ways I am expecting it turn out for me just like so many sports seasons. And, frankly, as we say here in France, "J'en ai marre!" That means, "I'm fed up!" I'm tired of losing. And I'm especially tired of the pessimistic feeling that when push comes to shove, my team will find a way to lose. Or, the other team will find a way to win. They always do. This is OK in sports. But in the real-life world of issues that count, I find myself slipping into the same attitude. Injustice will continue to flourish. And, most importantly to me, my Christian brethren will continue to walk with huge blind spots about many key justice issues. This runs counter to everything I'm supposed to believe as a Christian. It runs counter to the things I teach when I talk to people about reconciliation. In the end, one doesn't embark on such difficult things as reconciling fractured relationships without the feeling that it can happen. That we can succeed. That ideas can change and evolve. That's what makes us able to endure the struggles. The hope that we can achieve the goal. Without the hope, we can't do the hard work necessary for change. I know that first hand. But yet, there I lie, feeling hopeless after the Browns lost. But I was also feeling hopeless about this election cycle. Not about who would win or lose, but rather about how. About how my fellow Americans -- especially those who share my faith -- are thinking and talking about this election. And about what all of this means about the state of this faith, and my home country. You see, this election was supposed to be different. Many Christians had risen up to stand against the idea that abortion and sexuality were the only "moral" issues. They weren't going to buy into the idea that one party had a monopoly on God's politics. They were going to think about economic morality and morality in foreign affairs. They were going to realize that schools and health care and wealth distribution were all moral issues. They were going to think and see Scripture through eyes that had been closed for many years. And perhaps this is the case for many. But, on this night I found myself thinking about the recent visit of some retired missionaries who came back to see some of the people they knew when they served in France. I work with the son and daughter of the couple they were visiting. The daughter immediately called to get my opinion on what she considered a shocking lunch, during which she, her brother and parents learned that Barack Obama was a Muslim and/or the Antichrist. Yes, if Barack Obama wins this election, the retired missionaries told them, then this was a sure sign that Jesus would return soon! OK. I'm no expert in eschatology. But this seems to be a bit of a stretch, theologically speaking. Does the Bible say the Antichrist will refuse to oppose abortion or denounce homosexuality? I missed that. The missionaries went on to explain to my friends that no real Christian is supporting Obama and that his popularity is demonic. My French friends were bewildered and quite shocked by this. Their opinion of Obama is pretty high, based on what they've heard from him and read (interesting idea: they listened to Obama and read in order to form their opinion). They've read his speeches on working together as well as his explanation of his conversion to Christianity, what it means to follow Christ for him, and his way of viewing faith and its application to war and other issues is in line with the way they and many other Evangelical Christians here see things. So, how could it be that this missionary couple, who they have always admired as faithful Christians, could have such a divergent view of things? When they told me the story, I shook my head and told them it's complicated. You'd have to live in the States for awhile to understand, I said. But then, I'm not sure I understand it either. I can't understand why so many Christians seem to buy the idea that helping the wealthy will eventually help everyone, even the poor, even when the evidence all around them suggests that the gap between rich and poor has been steadily growing (and, overall growth hasn't really been helped either). Or why they get upset about some welfare mother getting extra food stamps because she's "stealing our tax dollars," while they seem to have no problem with the billions being spent to bail out the rich and the powerful who have abused their privilege because of greed. Or why, whenever these issues are brought to the table, they allow themselves to be distracted by silly patriotism debates and other matters that neither candidate is going to spend much time addressing once elected. How they can still believe that Obama is a Muslim when they could easily read his own faith story and check out his record to see what he believes. I won't go on today about this here, but I'm struggling not to be disappointed in what I see. I had hoped for so much more. But I keep seeing my brothers and sisters dropping the ball. OK. This has nothing to do with reconciliation or any of the stuff I usually talk about here. The other day I was grocery shopping in a little chinese store in our neighborhood and was thrilled to come across lima beans for the first time since coming to France. 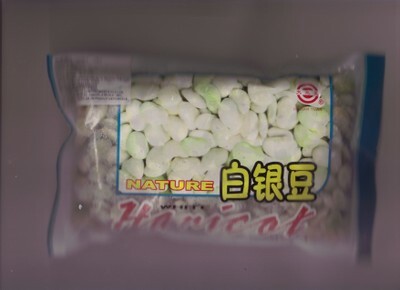 They were frozen and labeled "white haricots" but they were indeed lima beans. But when Jenny opened the bag to cook them and looked at the directions we were in for a treat. On the left, the directions were in Chinese. On the right, someone had obiously run the chinese through some automatic English translator program. * The series material of this product all takes from nuisanceles base, is through artificial selection and high-temperature quick freezing. * Serue by steam. cook or stir-fry after defrost. Encouraging signs from Burundi, according to a New York Times report. This is a nice report, with some good background info. Weather has been great here in Paris for about two weeks straight. Almost never does that happen! Anyway, I was riding a bike through the city with my wife, Jen, the other day and a quote came to my head. It sounded good and I made a mental note of it, promising myself to explore its validity later. "You can be whatever you want to be, as long as what you want to be is what you are." I don't know if that is cynical or encouraging. Depends on how you read it, I guess. Something most people don't know about me. When I was a kid, I believed I could become the first black president of the United States. I thought I had something that would be necessary: the ability to talk to and gain the confidence of white people so that they could come to see what needed to change in order to make the country a fair place for everyone. I thought I could be the kind of bridge person that understood the perspectives of white and black America (sorry, in my Ohio thinking of the 1970s and 1980s, those were the only two Americas that existed) and could help create understanding and progress in solving our racial division. I really thought I could be that person. But with age and experience, ideas like that gave way to cynical frustration, with both society and myself. 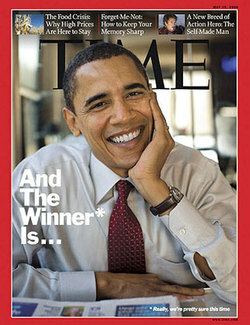 I came to doubt not only that America could change, but, more importantly, that I could ever really make a difference. "Who am I to think I could change America?" Deeper yet, "who am I to think I can change ANYTHING?" I still battle these doubts every week. When I'm winning the battle, I tend to write here a lot. When I'm losing, the inspiration to pick up the pen (OK, the keyboard) just isn't there. That's why I sat in wonder as I listened to Barack Obama's speech back in March after the Rev. Wright controversy first exploded. I heard him skillfully and frankly help people see the walls that keep Americans from understanding one another. The history. The feelings. I heard him honor and respect everyone, not pointing fingers and throwing guilt around, which tends to erect further walls. But at the same time he didn't shy away from the fact that there was still much from America's past that had to be dealt with it the country was going to move on to some sort of healed future. I had goosebumps as I listened. Not because of beautiful rhetoric and style. This was not a speech that touched emotions because of its style. This touched me deeply because of its content. It was exactly the type of thing I had dreamed about doing back when I was a kid. This is what I had imagined for myself. As a black man who has lived so often in the white world, so much about Obama’s experience mirrors my own. Trying to keep one’s voice and credibility among a people you understand and love while also trying to be a bridge toward the dominant society requires the skill of a deminer. And the consequences of each mistake are about as grave. Most of us who try to play the bridge role crumble under the weight of hundreds of years of guilt, anger, misinformation, abuse, etc. We give up after both sides of the divide turn on us and erode our foundations. Perhaps people are not basically good. Perhaps there is no way to escape this cycle of hatred and revenge … perhaps it is just better to work to improve the lot of our group on our own rather than trying to change the system that separates us. In recent weeks, the optimism that Obama had begun to awaken in me during his historic run had begun to retreat back into its assigned place in the cave of fatalism. “Here we go,” I thought to myself as I saw the reports on Obama’s preacher come out. I had known about this church for some time, so it was no surprise to me. But like most of us bridge people, we try to keep separated things that one side or the other can’t grasp. We know what will happen when these oil-and-water moments occur. We hope we can keep building the bridge before the oil and water rise. Even if you understand it, how do you help someone outside the black American experience get it? I thought Obama did it about as well as one could. I came away encouraged that he is a person of enough depth and talent to know how to talk about these issues to those who want to listen and learn. Today I’m sticking my head out of the cave a bit. Perhaps tomorrow I’ll be ready to go back to building those bridges. Since then, of course, Rev. Wright and the TV news folks have sent me back into the cave a bit. I've struggled again with those voices telling me that the things that divide people (whether they be black and white Americans or Hutu and Tutsi in Burundi) are simply too strong, too entrenched, fundamentally insurmountable). But I believe, as peoples, that we are not meant to be divided. We are not meant to be selfish and oppressive, unforgiving and resentful. That's not who we really are. I refuse to believe it. I believe we are something more. And so, we can be something else. Something more. If we want to be, we can be people who repent. ... people who forgive ... people who put their hands together for justice and equality ... we CAN be those people, because, fundamentally, that's who we really are. That's my hope. I'm clinging to it. Without that, I've got nothing. No, I don't believe I can be president anymore. But that's because that's not who I am. But I can still be a bridge. A peacemaker. In case you haven't noticed, I'm not a very consistent blogger. Like most of the batting lineup of my beloved Cleveland Indians, I went O-for-April! I have come to understand that I have a rhythm about me. There are times when I take in, and times when I put out. I have even amazed myself as I've watched the news go by without a peep from me in recent weeks. Obama and Rev. Wright. The contested elections in Zimbabwe. Subjects that are right up my ally, subjects that one would think would have me itching to write. I could blame busy lives, and kids schooling demands, my other work and deadlines, etc. But the bottom line is that I simply haven't had anything to say. I've been in a period of watching and reading and listening and observing and talking with people. Everytime I sat down to write I thought, "How does what I have to say on this matter offer anything worthwhile?" And I couldn't find an answer. So I wasn't inspired to write. But I think the silence is coming to an end. I think the tide is ready to go back out to sea. So, thanks for your patience if you're one of the folks who still bothers to check this site out! I've got dread locks now. I never intended to. It's been about three years now that I've stopped combing my hair or wearing it cut close to the skull. My Nigerian barber here taught me a simple way to style it, simply rubbing it in a circular fashion all over creating little twists. It was cool. As it got longer, people would mistakenly call it dread locks. No, I'd say. Dread locks don't come out. These come out when I wash them. Then I just twist them up again, and presto. But it's been more than a year since I've cut my hair now. And the twisting is no longer necessary. I've started to have to wear a band of some sort to keep the hair back off my face. But it was still cool. I liked it. Kind of funky. It fit me in the stage of life I was in. Breaking with convention. Challenging the surface impressions that sometimes trap us. But lately the hair has gotten to an unruly stage. And as I prepare for a round of seminars on reconciliation here in France and in the United States, followed by a planned trip to Burundi in March, I began to think that maybe it was time to cut off a few inches. Make myself a bit more presentable. No problem. I just wash it out, pull the twists out, comb it into an afro and sheer off about half of it. But no matter how long I soaked it in the water and tried to comb through the knots, I realized the twists were no longer untwistable. I don't know what makes an official dread lock. But I've got to be pretty close to the line. There is no discernible braiding pattern that can be undone. The strands of hair are meshed together in a complex pattern, crossing over to different stands and back again. Sometimes there are loops, sometimes there are bunches of hair on the end of a strand that you realize actually belonged to another root before being severed from it many months ago. But instead of falling to the ground they grafted their way into this new strand, taking on a new, rootless life as a dangling ornament. I hadn't examined it all closely before. But tonight I realized that some of the locks have no form at all. 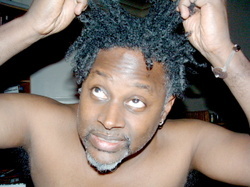 They are just thick cords of matted hair that have long since stopped being definable as a twist or a braid. It's just a long, tubular mass of hair. More of my head than not is now in this form. And I never noticed it happening. Tonight I just opened my eyes and realized I had dread locks. I could try to undo them if I wanted to, but it would be an exercise in futility. The only way to make order of this mess would be to cut it all off and start at zero. This intrigued me as I lay in the bath water running my fingers through my hair. I couldn't help but think of the subject that has been preoccupying me lately: The tangled mess of world history and the need for people to forgive and repent for what they've done to one another. As we prepare to return to Burundi in March, I've been doing a great deal of research on forgiveness and repentance, the two parts of the reconciliation equation. I'm reading three books concurrently. One is called Genocided, the story of a victim of one of the genocidal attacks in Rwanda in 1993. Another is Inclusion and Embrace (see my books), and the last one is a text booky compilation of essays in French called "The Black Book of Colonialism ... from Extermination to Repentance." Just as my hair makes me want to get out the scissors, the reality of human conflict seems overwhelming to me even as I sense a call to wade into its knots and weaves and braids. The hopefulness I feel when I read the logic of the gospel message ... how it really does make sense in the face of the problems we see in our personal lives, our interpersonal relationships and even for enmity between peoples ... all that positivity surrounding the simple truth of the theory begins to fade when my eyes refocus on the tangled knots and matted reality. Like the hair ripping and breaking as I try to run my fingers through it, I feel the potential for pain and splitting that will accompany any effort to make progress on reconciling peoples as I believe we are being led to do. I realize what a tangled mess of a world we live in. And I wish I could just cut it all off. But then, I don't really want to cut my hair either. It took me a long time to get it like this. I never had long hair back in the '70s when it was the cool thing to do. My new identity is so tied to this hair. Cutting it will feel like I'm losing something. More parallels with the reconciliation process? Stay tuned and let's think about it. I don't suppose anyone is there. You have probably all lost hope of ever seeing another post. I can't believe it's been since May 31! Wow! But I haven't given up. I'm launching my latest comeback. And to make things more complicated, I'm doing so on the day I leave on a 10-day trip to Burundi. I'm leaving tonight from Paris on an 11 p.m. flight that arrives in Addis Ababa, Ethiopia, at 7:20 a.m. Saturday. I will layover there until 10 a.m., when I take off for Bujumbura, the capital of Burundi. I get there at 1 p.m. ... So in all, it will be a 14-hour trip! Sounds like fun. This will be my first time flying on Air Ethiopia. If I can work out the technology (a big if), I am planning to post at least small things each day while I'm there using Jen's cell phone. The main purpose of the trip is to talk with some leaders of different churches and social organizations about the necessary link between inner-hearling, forgiveness and reconciliation. Because of the country's history, there is talk of reconciliation everywhere. But can we be reconciled with others when we are not reconciled with ourselves? That's what we will be exploring. What I'm excited about, though, is the way the planned mini-conference (September 15-16) is set up. We're doing this through The Bridge, a fledgling network for development in Africa set up by Augustin Nkundabashaka, a pastor from Burundi with whom I'm working. We will not be coming as outsiders to tell Africans what they don't know. The attitude is that we will be sharing a perspective on forgiveness, etc., but the real point is to discuss together with the people there how this applies in their context. I, as someone from the West, have just as much to learn from them as they do from me. In fact, I have much more to learn from them when you consider that the information I will be sharing they certainly already know something about (if not better than I do!). But understanding how principles of forgiveness and reconciliation play out in this non-Western culture that has known genocidal crisis ... that I know NOTHING about. What does forgiveness look like in this context? What have they learned about the power necessary and the power that comes through such experience? What do they know about God that I have yet to discover? We'll see. Hopefully, I can get this posting thing to work so you can find out along with me while I'm there. If not, you'll have to wait until my return and hope I make good on my comeback attempt. Thanks for your prayers for me and the family I'm leaving behind. Is there immigration in the Kingdom? It seems to me that those of us who are followers of Jesus would be helped along in our thinking on immigration if we think first in Kingdom terms. The debate around immigration, regardless of the countries involved, naturally centers on borders and nations and people groups. We want to protect our country from outside forces that will take jobs, or drive down wages or bring in other languages, customs and religions, etc. I understand these are delicate issues. But Kingdom thinking influences us in at least two ways (perhaps you can think of a few more). 1. Where are the borders to the Kingdom? If we become less concerned with our particular country or people group and more concerned with the Kingdom and God's people everywhere, all of a sudden many of the arguments for keeping people out start to fade. 2. Justice. God's word speaks volumes about justice to the poor and weak. Not taking advantage of them, etc. There is also a great deal of precendent for making things right for past wrongs. We don't often talk in the West about how the Western countries became so much richer than most of the countries from which many of the world's immigrants are coming. Colonialization. Slavery, and more recently, exploitation of these country's people and resources without paying a fair price for these resources. The West has become rich at least in some part at the expense of the rest of the world. And the West has done much (intentionally or not) to destabilize and handicap many of these nations. We have wanted to remain the power of the world, to keep getting cheap products and labor to fuel our way of life. ... and this has not come without a price for the rest of the world. Now, the West is sharing in paying the price. Because the rest of the world is at the doorstep of the West. The baby in the basket is on the doorstep with a note. "Feed me. Change me. I'm yours." In the individualistic West we are not accustomed to thinking about the sins of our forebearers. But the Bible gives us many examples of people taking responsibility for and asking forgiveness for the sins of their people -- not just their own personal sins. The non-Western world still thinks this way, for the most part. They see cultures as a whole. And they see the past and the future as necessarily linked. ... And I think they are right. So what does this mean for justice. There is something right about immigrants coming to the Western countries that previously came to them. The French went, uninvited, into North Africa and West Africa (among other places). They took riches and made money in these places. They created social problems that still exist today. So, should they not accept North Africans who are coming to France looking for economic opportunity? If America has built one of the highest standards of living while doing things that have left other countries among the world's lowest, is it not normal that as we absorb the poor from some of these places that our standard of living might decrease a bit? These are justice issues. God is concerned about justice. ... Sometimes we are concerned about "just us." ... A kingdom thinker can't do that.